The Scaligero Castle of Sirmione on Lake Garda is one of the most imposing medieval fortresses in Europe to have been built entirely on water. Over the course of the centuries it has been the theater of many cruel events and its charm has contributed to many legends. The construction of the fortress known as the Scaligero Castle, belonging to ex Lords of Verona, begun around the middle of the 13th century above remains of a roman fortification. Its edification was ordered by Leonardino della Scala, also known as the Mastiff of Scala, during the magistrate period of Verona. The purpose of the construction was to own a defensive structure that also procured portual control, given how Sirmione's position near the border greatly exposed it to the threat of assault and aggression. 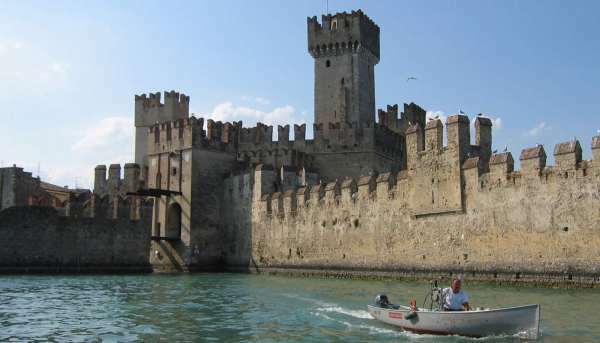 The Castle of Sirmione also represents the forced passage from the mainland to the thin peninsula that gives life to Sirmione. An independent fortification was added around a century after the initial construction to strengthen the fortress's defenses, uniting the new barbican to the main one, and adding two new internal courtyards. When Sirmione and its castle were handed to the Republic of Venice in 1405, a project to strengthen further the defensive structure was begun. The dock that people can see and visit today was built in this period and was modelled after Venice's arsenal style, substituting the previous wooden dock. From the 16th century on the Scaligera fortress begun a slow and inesorable decline, due to the growing importance of the nearby fortified town of Peschiera. The castle's current looks are the ones that were defined during the restoration of the building between 1917 and 1935. The Scaligero Castle is surrounded by water on all fronts, and is a tall and majestic guardian and protector of the city. Nowadays we can admire its imposing battlements, the tall towers and the drawbridge that connects it to to the mainland. The drawbridge is its only point of access. Upon entering the castle the first thing we can see is its main courtyard, surrounded by angular towers where we can observe the castle walls and its sparrow style battlements that are typical of Scaligera castles. Behind the three great towers is a 47m tall keep, under which the dungeons were kept. Inside the building there is a portico with a roman and a medieval lapidary set up inside, as well as a gallery with various information regarding the fortress. Climbing some stairs and a drawbridge we can access the second paddock. From here we can climb up to the higher area of the castle and reach the top of the tower, where we can admire the landscape of Lake Garda and the dock. The legend of the Sirmione Fortress states that a boy named Ebengardo lived in the castle with his lover Arice. The couple's quiet life was one day abruptly interrupted by tragedy: on a stormy night with strong rain and wind, a knight presented himself to the castle as Elaberto, Marquis of Feltrino, and requested shelter. The couple agreed, but the knight, struck but Arice's beauty, decided to join her in her room during the night. Caught by surprise, the girl started screaming in fear, and Elaberto stabbed her. Awoken by the cries for help of his beloved, Ebengardo ran to the room where he found Arice lying lifeless on the ground, and blinded by rage, killed Elaberto with the same knife. Legend says that young Ebengardo's soul, desperate in his failure to protect his lover, still roams the castles today on stormy nights looking for his Arice. The Scaligera Fortress is one of the best maintained fortresses of Italy, is a rare example of a portual fortress and is the symbol of the town of Sirmione. Sirmione is one of the most sought after destinations on Lake Garda. In 2017 alone it received more than 1 million and 200 thousand tourists, who were also attracted by other places of interest such as the hot springs or Catullo's Grottos. In the summer the castle also hosts various high quality artistic shows. Access to the castle is available everyday except mondays, but it's always better to look their timetable up, since opening hours vary in summer and winter. The first sunday of each month entry to the castle is free of charge. If you look for them, there are also tickets that allow you to see both the castle and Catullo's Grottos, the ruins of an ancient roman villa built in Sirmione between the first century b.C. And the first century a.d. The view from the castle is particularily breathtaking in the evening when the sun is going down and the light kisses the fortress gently, reflecting itself in the water and giving Sirmione a fairytale charm. 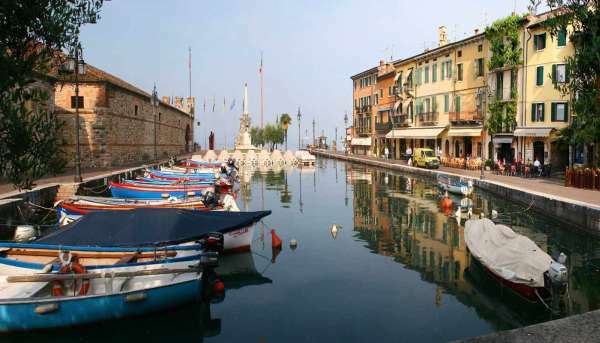 During this tour we will sail towards the pearl of the lake: the village of Sirmione. We will sail from Salò and will brush all the main beauties of the lower lake.